Atlanta based death/black metal band, Darkening is a project of composer, producer and drummer Jeff Carter. Darkening is one of those bands who know very well how to merge “soft” elements with dark music without killing its meaning with melodic death metal influences and ambient guitars accompanied with growls. Darkening recently released their debut album titled “Augür.” The record feels like a medium that hides the feeling of loneliness in its forsaken sound. Not only the music, but also lyrics and artwork help to feel the darkness. Simply it can be told that the name of the band feels right. There are nine tracks in total on “Augür.” It kicks off with a nice instrumental intro. In some parts of the album vocals are done in a death metal way, but drumming is more characteristic for the black metal genre. “Augur” is not just a raw album. It also has its emotional side. This album perhaps summarises a part of one’s life. That is why I found it different and gave this album a spin. Check out this record if you are looking for a release that is aggressive, dark but also emotional. Buy “Augür” from Bandcamp here. Follow Darkening on Facebook. Comparing these two releases, it’s evident that the band grew up and became more cohesive. With “Miracles” they are going more than thirty years back, where the roots of rock and metal are. “Miracles” is a tribute to the best of that era, the band stay truthful to their sound wrapped up in new attire and are ready to rock more than ever. The album that was released this past March is quite a short for today’s standards with its approximately 40 minutes and ten tracks. Its sound is something that our ears are accustomed to. Every person who has interest in rock and metal music has come into this kind of sound at least once. Singer Daniel Brönnimman is a perfect fit for singing Orymus’ songs. His vocals for Orymus is like a chocolate cake that accompanies coffee. From the very fist moments of the album until the finishing melody guitar solos are striking, and accompanied with stunning vocals by Brönnimann they make “Miracles” an enjoyable experience. It’s been a long since I heard such a refreshing release coming from this genre, and though vintage in its nature “Miracles” does bring a lot of refreshment. All of us started listening to music with likes such as Led Zeppelin, Whitesnake, Rainbow or Deep Purple. Orymus is influenced by these greats but with lots of elements developed by themselves. If you are a nostalgic person, it is the right time for you to give a try to this underrated Swiss band. You can buy “Miracles” from Bandcamp. It would be good if you follow Orymus on Facebook too. It makes perfect sense that Pearly Gates came together as a result of a planned hybridisation of Tool, Black Crowes, Porcupine Tree and Pink Floyd. This Finnish quintet are wholly infused with the same penchant for adventurous art introspection. Pearly Gates tether themselves not only to the erratic expressionism of progressive rock, but touches of alternative / pop rock styled consciousness expansion as well. A bombastic affair, Pearly Gates are predominantly led by gracious singing of Jonne Nyberg, who also handles guitars, saxophone and harmonica. Their incisiveness and edgy tones cut the path for the excitable raw guitar work and ever unpredictable percussive collapse that follows. Despite its heady nature, a sense of playfulness is exhibited throughout the four-track release. White the guys are certainly enjoying what they do and have fun, there is a determinism instilled wishing their songs that keeps them pulling to an eventual conclusion. It is a meaty listen that runs the sonic gamut from and to wide spectre of influences. Dynamically charged and musically gifted, Pearly Gates plow through a colourful array of punchy grooves and extravagant melodies. But rarely do they get lost in the clouds thanks in part to the considerable weight of their low end focus and continual efforts to make their sound diverse. Abrasiveness emerging from heady indulgence rather than overpowering distortion is a refreshing change of pace. It may not be a pick for everyone, but those who have record collections that include the mentioned groups are in for quite a treat. “Unchained” is available from Bandcamp. Follow the band on Facebook here. Turbulence are a Lebanese progressive metal band and “Disequilibrium” is their debut album. This is progressive metal that sounds not too far removed from a modern version of 90’s progressive metal with a bit more of distorted guitar and melody. The music has a similar feeling and immersive quality, only updated for the present day. The songs are easily assimilated, with honey-dipped melodies and top quality prog metal riffing seemingly on demand. Although this is the band’s debut, the performance is exquisite and their songwriting skills are highly developed and advanced. This is an album that is put together extremely well. The interplay between vocals, guitars and keyboards is well-judged and everything fits together flawlessly. “Modern” progressive metal doesn’t always sound this professional, slick and polished, but there is still an edge here and a depth to the songs. Turbulence know what they are doing, and this is shown throughout the music. “Disequilibrium” is truly an enjoyable album. “Disequilibrium” is available now from iTunes. You can follow Turbulence on Facebook here. Drummond is a guitarist from New York who just released his debut EP titled “Getting Comfortable.” His music is largely based on progressive rock/metal and jazz fusion. For a debut release, “Getting Comfortable” sounds very professional and imaginative, it’s is a release that has a lot to offer. “Getting Comfortable” is almost completely an instrumental recording. It includes four songs that are centered around the mixture of jazz fusion and progressive rock, but there are also some other influences that add up to the overall taste. The EP seems to be balanced very well between the progressive and fusion parts, but the transitions between the two feel rather smooth than forced. “Getting Comfortable” is mainly guitar-focused release, and Drummond does his job flawlessly. The closing song “Ecotone” also features Sithu Aye on guitar, who brings refreshment to the EP’s sound. The same song features Sara Donnellan on vocals who brings depth and breaks the “monotony” of an otherwise fully instrumental track. Fans of jazz fusion and instrumental progressive rock will enjoy this record, and it’s one of 2015’s best newcoming releases. Give it a try without hesitation. You can get “Getting Comfortable” from Bandcamp. Split Bearing is a progressive metal band from Czech Republic. The band has been active since 2002, and although they experienced a few line-up changes thy recorded two full-length records so far. Their most recent offering is 2014’s album “Welcome to the Present.” Featuring nine songs, “Welcome to the Present” is a progressive metal album to the full extent. Perfect clean vocals hit straight along with the strong guitar work. Singer Petr Duliskovic carries an almost identical resemblance to the voice of young James LaBrie. This similarity washes your ears with more of familiar progressive metal sound. It’s stripped-down just like the old prog used to be. Songs on “Welcome to the Present” are between 6-7 minutes long. Both lyrically and melodically the album keeps its levels pretty high. The opening “Shattered” is an absolute highlight and it seems that other tracks are a bit shadowed by this piece. Not that other songs are bad, quite the opposite. It’s just that the band choose to open the record with their best piece, what I think is a bad move when it comes to marketing. Split Bearing are obviously influenced a lot by Dream Theater. In every melody and rhythm these influences are easy to notice. If you are a fan of Dream Theater’s older material, this album may be a pleasant experience. Buy “Welcome to the Present” from Bandcamp, and follow the band on Facebook for more news. Prospective from Bologna send a warm progressive metal breeze with lots of djent particles in the air. This five-piece band came up recently with their debut EP titled “Chronosphere,” and though I cannot tell that they made something new this release is fairly good launcher for the start of their career. Feelings stuck between emotion and aggression are something that “Chronosphere” is made of, both lyrically and musically. All in all, for an unexperienced, new coming band to the scene, Prospective made a good deal with “Chronosphere.” Fans of progressive djenty metal will be satisfied. The follow-up to this release will be crucial, and if the band manages to deliver a release that stands up to standards, we are talking about something possibly huge. Get “Chronosphere” by Prospective from Bandcamp. Follow the band on Facebook for news and more. Hailing from the beautiful central Italian region of Umbria, Ornithos (Greek for “bird”) features three members of Il Bacio della Medusa, one of the most interesting Italian progressive rock bands of the past few years. However, Ornithos predates Il Bacio della Medusa by a few years, and was originally created by multi-instrumentalist Diego Petrini and bassist Federico Caprai in 1999. The two musicians were joined by Eva Morelli in 2007, and subsequently by the three remaining members, vocalist Maria Giulia Carnevalini and guitarists Antonello De Cesare and Simone Morelli La Trasfigurazione, their debut album, was completed in 2011 but released in the early months of 2012. The cover artwork by Federico Caprai features the band’s symbol, the ibis, which is a reference not only to their name, but also to Thoth, the Egyptian god of knowledge, music and time. For a debut album, La Trasfigurazione is a very ambitious endeavour, bearing witness to the many years of work and dedication behind it. With 13 relatively short tracks arranged in three chapters, it is a concept that hinges on a man’s spiritual journey through the past, the present and the future. True to the Italian progressive tradition, it is also boasts dramatic flair, gorgeous yet occasionally intense melodies, and plenty of variety to keep the listener on their toes. However, unlike many albums that share similar features, the concept is mainly conveyed through music rather than singing. Indeed, the majority of the tracks are instrumental, showcasing the amazing technical skill of the individual members, as well as very tight band dynamics and a remarkable ability in developing a narration without the use of too many words. Eclecticism is the name of the game on La Trasfigurazione, an album that honours the golden age of Italian prog while at the same time searching for new avenues of expression. The lush symphonic apparatus of mellotron and other keyboards is beefed up by a twin-guitar approach more typical of classic rock than prog, and the prominent role of Eva Morelli’s saxes lends a sleek, jazzy allure to the sound. While the synergy between flute and guitar, hovering between gentleness and aggression, inevitably evokes Jethro Tull (a big influence on many RPI bands, both old and new), Ornithos’ sound rests on a tightly woven web that relies on the contribution of each instrument, finely detailed yet part of a whole. The vocals, on the other hand, almost take a back seat, although the contrast between Diego Petrini’s low-pitched, almost gloomy delivery (sharply different from the quasi-operatic style favoured by many Italian prog singers) and Maria Giulia Carnevalini’s soaring, blues-tinged tones deserves to be further exploited in the band’s future outings. The sounds of tolling bells and a ticking clock lead into “L’Orologio”, whose brisk, dance-like pace introduces the album, illustrating the band’s modus operandi. The strong hard rock component of Ornithos’ sound emerges at the end, with a driving guitar solo propelled by high-energy drumming and supported by sax and organ. Petrini’s distinctive vocals make their entrance in the low-key “La Persistenza della Memoria”, and lend a somewhat ominous flavour to the first half of “Somatizzando l’Altare di Fuoco”, a cinematic number that blends echoes of Morricone’s iconic spaghetti-western soundtracks with a vintage hard-rock vibe and an unexpected, laid-back jazzy ending. The nostalgic tango of “L’Ipostasi” wraps up the first chapter. Introduced by the upbeat “Al Torneo”, the second chapter develops in eclectic fashion with the blaring sax – almost in free-jazz mode – of “L’Arrivo dell’Orco – Fuga”; then it takes a more mellow turn in the Canterbury-tinged “Nuvole e Luce”, which introduces Maria Giulia Carnevalini’s soulful voice paralleled by melodic flute – before plunging deep into hard rock territory with the raging Hammond organ of “Ritorno al… (Reprise)”. “Salamandra: Regina di Psiche e di Saggezza”, probably the album’s climactic point, begins in subdued, almost mournful fashion, then soon unfolds into a dramatic, riff-laden jazz-meets-hard-rock workout that brings to mind the likes of Colosseum, Banco and even The Doors. The third chapter opens with the blues-rock suggestions of “Nel Crepuscolo”, while “La Notte” ’s slow-paced, riff-laden heaviness conjures echoes of Black Sabbath, compounded by a wild, distorted guitar solo and aggressive, almost harsh flute. Then the serene textures of “L’Alba del Nuovo Giorno”, with a lovely sax solo that made me think of the airy, jazz-tinged elegance of Delirium’s magnificent comeback album Il Nome del Vento, bring the main body of the album to a close. In fact, while the jazzy “This Is What We Got: The Flute Song” is undoubtedly a beautiful piece of music – showcasing Antonello De Cesare’s guitar skills in a great solo backed by organ and sax – it feels like an afterthought of sorts, especially on account of the English-language lyrics, which detract from the uniquely Italian character of the rest of the album. As is the case with most Italian progressive rock, La Trasfigurazione can be somewhat of an acquired taste, and definitely not for those who favour a minimalistic approach. Musically speaking, even if the album might command the controversial “retro” tag, there is also a sense of modernity in the band’s omnivorous approach which pushes Ornithos’sound into the 21st century. True, the album occasionally comes across as a tad overambitious when it wants to cram too many ideas into a limited running time of 56 minutes. However, this is a band that possesses talent in spades, and La Trasfigurazione will make a strong impression on lovers of everything RPI – as well as providing a fine complement to Il Bacio della Medusa’s newly released third album, Deus Lo Vult. In the past few years, Leonardo Pavkovic’s Moonjune Records has become a go-to resource for fans of guitarists that eschew the tired antics of traditional “guitar heroes” to focus on creative, envelope-pushing playing put at the service of the music. In the past few years, outstanding players from far-flung locales such as Indonesia have become part of the Moonjune roster – with noteworthy releases such as Tohpati Bertiga’s Riot, Ligro’s Dictionary 2 andDewa Budjana’s Dawai in Paradise. Brazilian power trio Dialeto are the latest addition to the New York label, getting their first international release with their third album, The Last Tribe. In the two years following the release of Chromatic Freedom, the São Paulo outfit, founded in the late Eighties and led by guitarist and composer Nelson Coelho, have replaced original bassist Andrei Ivanovic with touch guitarist Jorge Pescara – a change that has influenced their sound in a rather interesting way. While Chromatic Freedom featured a few songs with vocals, on The Last TribeDialeto have taken a completely instrumental direction, concentrating on compositions that blend King Crimson-style angular, asymmetrical patterns with heady Latin suggestions and fiery blues licks, occasionally with a keen metal-like edge. Though some reviewers have labeled them as jazz-fusion, the latter genre is only one of the ingredients of Dialeto’s heady brew. While technical virtuosity is definitely emphasized, Dialeto’s musical offer exudes a surprising warmth and a pronounced sense of melody – which is not always the case with all-instrumental albums. Corvus Stone are another band made possible by the convenience and networking of the internet. It’s a story most of us can appreciate really; Finland’s Pasi Koivu got in touch with Bunchakeze guitarist Colin Tench in hopes of a collaboration, and within no time at all, the online jam had grown to include a host of likeminded musicians. Although the strings remain ultimately pulled by Koivu, Corvus Stone may be seen as a meeting place and dialogue for some of progressive rock’s underground heroes. In a sense, it’s refreshing to hear an album that’s come together with such enthusiasm and sincerity. Indeed, the talent of those involved makes Corvus Stone’s self-titled debut an enjoyable piece of composition- oriented instrumental rock, although the fluid, as-it-comes way the album came together keeps the album’s pieces from coming together as a fully satisfying whole. Although Colin Tench is the musician I am most properly familiar with (for his work in the symph prog act Bunchakeze), some of these musicians I have been at least aware of. For one, Pasi Koivu has a longrunning association with the classic band Black Widow as their archivist, and I have more recently heard the work of guest vocalist Blake Carpenter, with his solo project The Minstrel’s Ghost. Last, but surely not least, the charmingly ubiquitous Sonia Mota lends her talent with visual art to the project, giving the record an appropriately diverse and dense album cover. 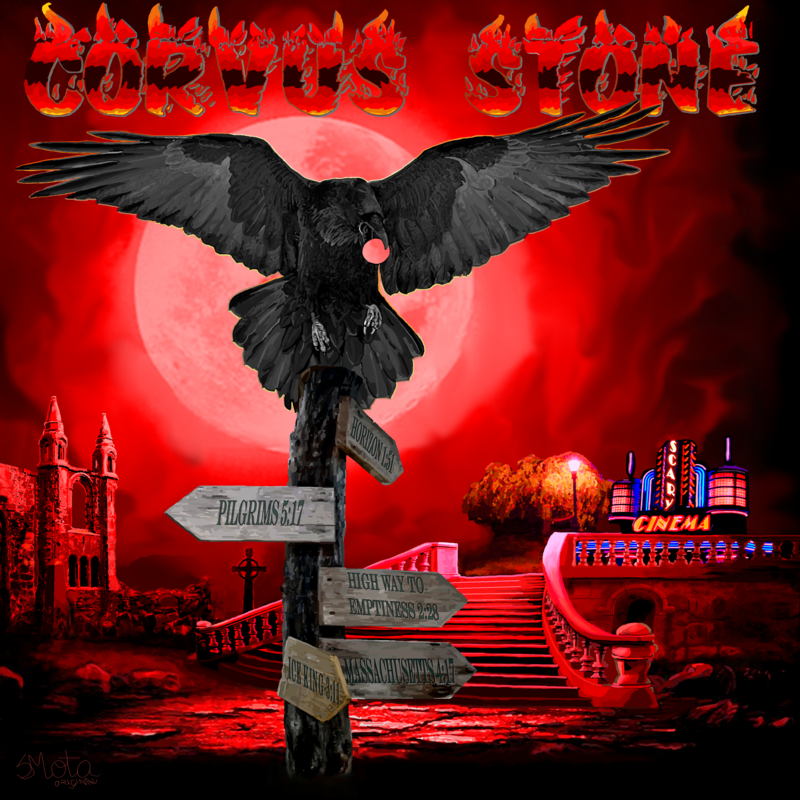 Although I have not been introduced to the others (through their music or otherwise), it’s clear that Corvus Stone consists of a remarkably consistent and skilled ensemble of musicians so involved because they enjoy what they do. It’s as if the intention of Corvus Stone is to take in all of the best things from these artists, and forge something exciting out of it. Fortunately, this open dialogue results in some great musicianship across the board. With so many ideas inbound however, “Corvus Stone” often feels unfocused and even aimless. At twenty one tracks and almost eighty minutes long, it’s clear that Corvus Stone are not worried about being succinct in their music. Their largely instrumental work is divided either into bite-sized idea sketches, or drawn out jams that recall Pink Floyd. Although a handful of songs are able to escape the clutches of either fault, there’s very little balance here. Pasi Koivu is evidently a strong composer as some of the album’s better tracks attest; the record’s shooting star “Ice King” is effective, concise and haunting. “October Sad Song” is a little more jam-oriented, but never forgets to throw in a firm hook or two. Unfortunately, too many of these songs seem to end before they begin. Most of Pasi’s compositional ideas hold their weight on their own, but they are never explored to their potential. An intriguing idea that could have been fleshed out into a full song is often left as a two minute sketch, giving “Corvus Stone” the feeling of a compilation album, or a work in progress. On the other hand, the eight minute title track and eleven minute “Cinema” feel too longwinded. Colin’s omnipresent lead guitar is soulful and a joy to the ear, but there’s the nagging feeling that the ideas and musicianship would have been much better served with a more consistent approach to the compositions. Considering the album has (presumably) come together via the transference of files between countries and personal computers, the production here is remarkably solid and consistent. Colin Tench’s Floydian guitar style remains the album’s highlight, although the presence Blake Carpenter’s warm vocal style usually tends to indicate the album’s best tunes. There is some great talent at work in Corvus Stone, and many of the musical concepts therein are promising. For all of its enthusiasm and skill however, the album’s messy flow and utter lack of structure keeps Corvus from achieving their potential this time around. This debut has me thinking of a child’s playroom. There is colour, joy, and vitality here, but the the floor is dirty and things are scattered everywhere. Of course, as children grow up, they tend to adopt a greater focus. If Corvus Stone are able to realize the potential that’s plainly evident here, there could be a very impressive album in their midst. Until then, I’m left feeling somewhat underwhelmed.